Why Is Roof Slope Important When Selecting Roofing Materials? The pitch of your existing roof determines the materials you can choose for your new one. And if you find yourself completely set on lowering or adding roof slope, you can count on us to make it happen. First, however, you should understand why some materials fit sloped roofs better than flat ones and vice versa. 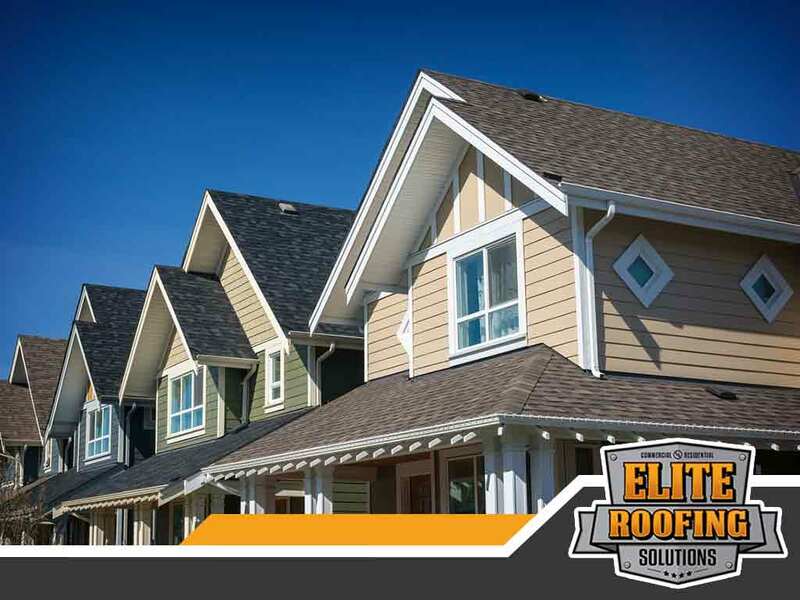 Elite Roofing Solutions, your shingle and tile roofing expert, can help you make a better decision about your roofing material based on the pitch of your roof. Water damage is why it’s important to consider your roof slope when picking a roofing material. In general, the steeper the slope, the better the water runs off it. The downside of a sloped roof, however, is that it’s exposed to wind damage far more than a flat roof because its surface is perpendicular to the typical direction of the wind. Meanwhile, a flat roof doesn’t experience such a degree of wind damage, but it has to deal with more water pooling on its surface, which could saturate the membrane and degrade it over time. That said, flat roofs are not completely flat. They have a subtle slope that drains rainwater and prevents it from causing damage. There are two highly recommended materials for this type of roof. The first is metal. It can accommodate the needs of a sloped or flat roof. Most flat roofs are associated with commercial building materials, including EPDM rubber (ethylene propylene diene monomer). While EPDM’s use is principally commercial, it can be used in residential roofs as well. It is thick and waterproof, making it the perfect material for a flat roofing system. Some of the best roofing materials for roofs with a high or medium pitch would be asphalt shingles, wood shakes, tiles and slate. These materials are fastened and secured by an expert roofer to defend your home against wind-driven rain, harsh storms and heavy downpours. We’ve got some of the best flat and shingle roofing experts to work on your installation project. We guarantee to not only match the roofing materials to your type of roof, but also to your area’s weather and your home’s aesthetics. Call us today at (855) 588-6601 for your roofing needs, or fill out our contact form to request a free roof inspection. We proudly serve residents of Woodlands, TX, and other nearby areas in Texas.